Denver, Colorado. 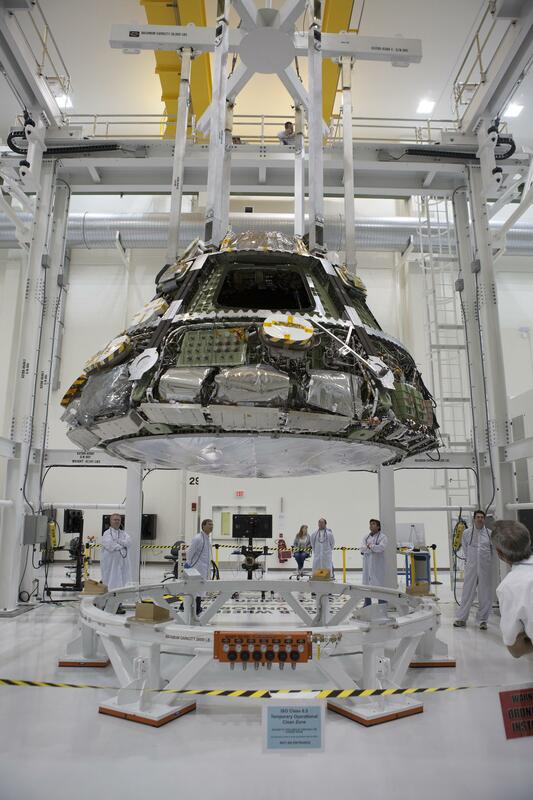 May 21, 2014 – Lockheed Martin and NASA engineers have started the process of installing the largest heat shield ever built onto the Orion spacecraft’s crew module. The heat shield installation marks one of the final steps in the spacecraft’s assembly leading up to its first test flight, Exploration Flight Test-1 (EFT-1), later this year. EFT-1 will provide data about the heat shield’s ability to protect the crew module from the extreme 4000-degree heat of reentry and an ocean splashdown following Orion’s 20,000 mph reentry from space. In addition, key systems such as avionics, separation events, attitude control and guidance, parachute deployment, and ground operations will be evaluated. EFT-1 is scheduled to launch on December 4, 2014 atop a ULA Delta IV Heavy rocket from Cape Canaveral Air Force Station’s Space Launch Complex 37. Comprehensive data from the test flight will influence design decisions most critical to crew safety to lower risks and safely carry humans on future missions to deep space. In the future, Orion will launch on NASA’s new heavy-lift rocket, the Space Launch System. More powerful than any rocket ever built, SLS will be capable of sending humans to deep space destinations such as an asteroid and eventually to Mars. Exploration Mission-1, scheduled for 2017, will be the first mission to integrate Orion and the Space Launch System.